Great shots . But albino means no colour. albino has something to do with the red eyes. The Albino guppy shows the recessive albino phenotype trait. This trait shows red eyes and the absence of black melanin. This type of guppy can appear in many colors. There is a Red Albino Delta and Tank class and any other colored Albino delta would be entered in the AOC(Any Other Color) class. Albinos with veils are entered in the Body/eye color class. Pregnant females should be place separately in a heavily planted tank since newly born babies have poor vision and can be eaten easily. Nevertheless, I dont care whether they can be called albino or not, as long as the guppy is nice, that's it, I like it he he! Very nice guppies those are and the photos as well. Albinism refers to lack of black pigmentation and not lack of color. Hence the eye color are red and you will not see anything which is black on the albino strains. Nice Guppies & good photography buddy. Guys, thanks for all the compliments. I believe there are many good quality full red albino guppies in India. Are they hiding somewhere? If I am from India, I would be more than glad to pass some of them to those who are interested. But unfortunately, I am not. In here we dont get the good Strains of Guppies and if by chance even if we get hand on those, we cant assure that those are line breed. I myself is looking out for Albino Full Red Guppies from long time. Is the black background made after photo by editing ? How is that rest of the area is pure black? Sudheer, I am using the Nikon's Creative Lighting System (CLS), 2 flashes are used. One a commander and the other a slave unit. So, the built-in flash at the camera is regarded as the commander unit whilst the Nikon SB600 speedlight acted as a slave unit. Very small aperture and very fast speed were applied. 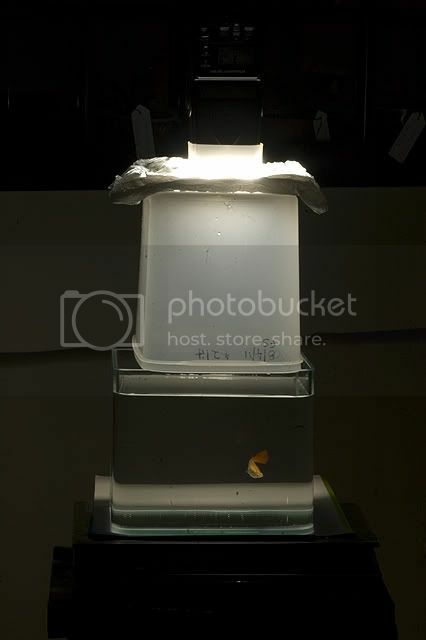 The SB600 was placed on top of the fish tank and the Nikon camera itself with the flash unit on, of course, in front of the tank. Quite tricky though, but with plenty trials and errors, only then the result is achieved. The result, a clear picture of the fish itself with black blackground. Once you can see the result as wanted at your camera's photo files, then you're on the right track. You got to do a little bit of editing to totally blacken the background. The photo was taken during bright daylight hours and at my apartment's balcony. Believe you me, look at the picture of the setup, the upper half which is black colour, is in fact a bright area of light from my balcony's opening. Oh dear, such a situation. Never thought of that though. A rough gauge of interest on livebearers at IAH here, I sense that interest isn't that great as based from discussion hereat. Frankly speaking, my red albino guppies as shown are of low standard compare to my buddies ones. Really you got a beautifull Specimen !! !